The Workers’ Memorial at the William W. Winpisinger Center in Hollywood, MD, is surrounded by bricks bearing the names of fallen IAM members. The IAM will remember members who have died on the job during a ceremony at 11:30 a.m. on Monday, April 28, 2014 at the William W. Winpisinger (WWW) Education and Technology Center in Hollywood, MD. The unions of the AFL-CIO observe Workers’ Memorial Day to commemorate the thousands of workers killed, injured or sickened on the job each year. 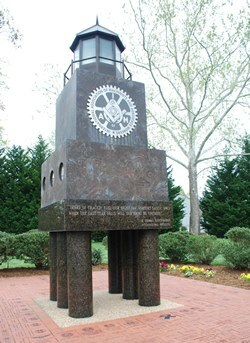 The IAM Workers’ Memorial Lighthouse was dedicated during the 2001 Annual Safety and Health Conference and has a special place on the grounds at WWW’s Memorial Park. Names of fallen workers are immortalized in a brick bearing their name and date of death around its base. Although decades of struggle by workers and their unions have resulted in significant improvements in working conditions, the toll of workplace injuries, illnesses and deaths remains enormous. Each year more than 56,000 workers die from job injuries and illnesses and another six million are injured. The first Workers’ Memorial Day was observed in 1989. April 28 was chosen because it is the anniversary of the Occupational Safety and Health Administration and the day of a similar remembrance in Canada. Trade unionists around the world now mark April 28 as an International Day of Mourning. Click here for more information and order forms to purchase posters, clip art, stickers, a WMD kit, and the Death on the Job report. All information is available in both English and Spanish.